We regularly receive questions from concerned enthusiasts about the condition of their palm. And even though it is always difficult to determine the exact cause of the problem (especially on the basis of an explanation alone) we will always be happy to help you with the problem. Since it are usually the same things that return, we have incorporated them in this article. First of all, it is useful to know what species of palm it concerns. After all, every species requires its own specific care. The species is indicated on the label or, if you don’t have it anymore, you can take a look at our palm trees page. The most common species are also among them. As soon as you know which species it concerns, you can determine whether the palm gets the correct care. The article “Palm trees care” can help you with this. Look at the origin of the palm for instance. Do you offer the same conditions as the original climate? A bit of background can also be interesting. Has the palm deteriorated since the purchase? Then the cause is probably an incorrect care. Has the palm suddenly deteriorated, then the cause is more likely to be found in a recent event? New location, repotted, plague…. 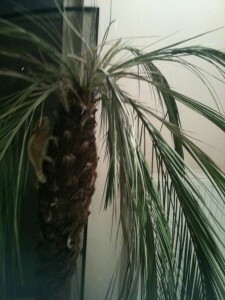 Exotic plants, and palm trees are no exception to this, are gaining in popularity. Many garden centres, sellers and nurseries do offer these plants by default now. Unfortunately, they don’t all have the necessary knowledge to advise you correctly. Always address yourself to experienced enthusiasts for the most appropriate care of your palm. Palms that are sold for a bargain sometimes do have a reason to be sold as cheap. Not infrequently, these palms have suffered more frost than they can handle. Unfortunately, the symptoms are often only visible much later. the new spears (folded new leaves) do not come when pulled slightly between two fingertips? the roots are in good condition (white-yellow)? 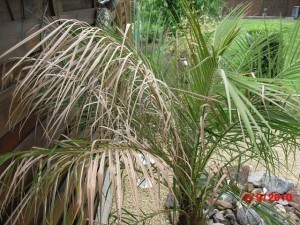 Once the exact cause has been determined, the palm can be treated. In most cases, a simple operation such as moving the palm to a more suitable location or repotting to a pot with sufficient drainage is usually sufficient. If you were not able to use this article to solve the problem, you can always contact us using the form below! We will gladly help you.